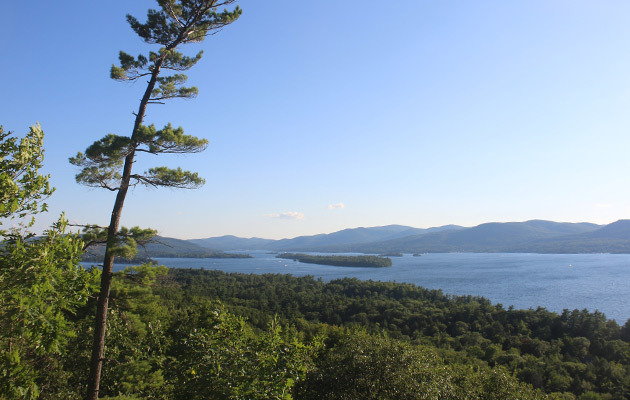 Stewarts Ledge is a relatively short hike on the east side of Lake George that rewards hikers with spectacular views of the lake and surrounding mountains. The entire climb takes only 20-30 minutes, and the incline is gentle, with the exception of one short, steep section. This makes it an ideal hike for beginners and those with younger children. The Stewarts Ledge trail begins at the Buck Mountain trailhead. To reach the Buck Mountain trailhead, enter 1750 Pilot Knob Road, Fort Ann, NY or the coordinates 43.509238,-73.631144 into your GPS. From the Adirondack Northway (I-87), take Exit 20 and continue past the outlet malls. Turn right onto Route 149, and continue until the intersection with Ridge Road. Turn left onto Ridge Road and continue until it intersects with Pilot Knob Road. Stay right onto Pilot Knob Road and travel 3.4 miles north, where you'll see a parking lot on the right (east) side of the road. If you reach the Pilot Knob Firehouse, you've gone too far. 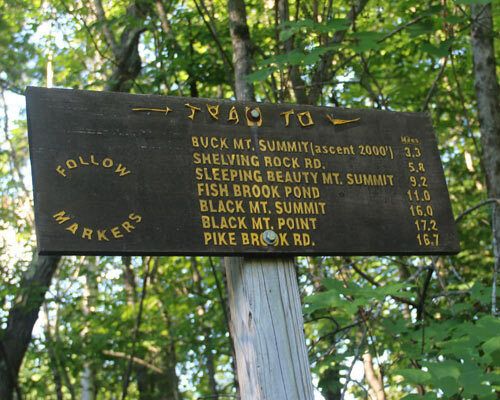 At the trailhead, you'll see signs referencing Buck Mountain, Shelving Rock Road, Sleeping Beauty Mountain, and other destinations. You'll notice Stewarts Ledge is not listed on the sign, and this is because the trail is unmarked. Take the marked Buck Mountain trail, and a couple hundred yards in, you'll see the marked trail continue straight ahead, a horse path branch off to the left, and an unmarked trail going off to the right. There is a large stone in the path at this point, and you should turn right onto the unmarked trail to continue to Stewarts Ledge. Keep following the well-packed dirt road, and you will reach the ledge. Interested in geocaching? The trail to Stewarts Ledge features one of the hidden objects!